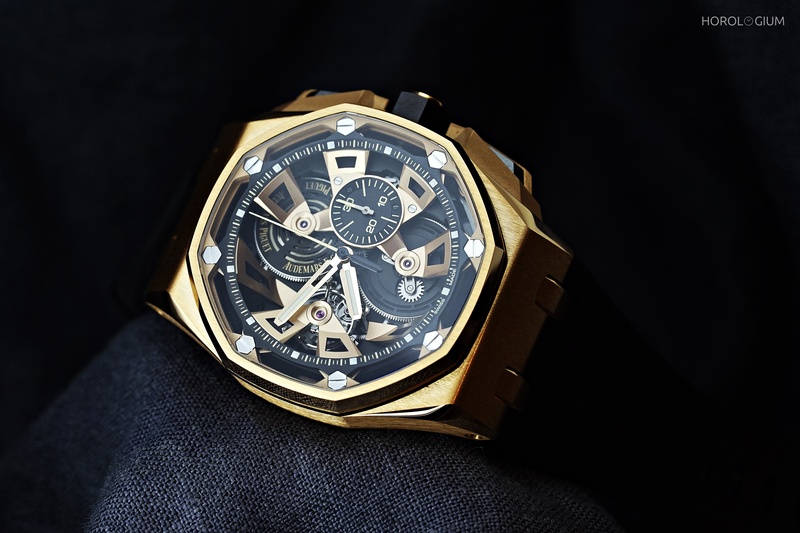 In case it passed you by, but we thought it would be a good time to mention that Audemars Piguet is marking the 25th birthday of its hugely successful and popular Royal Oak Offshore this year. The major marker of this has been the release of a limited edition model inspired by the 1993 model, plus the subject of today’s post, the limited edition Royal Oak Offshore Tourbillon Chronograph. Coming in both stainless steel and 18 carat pink gold, both in editions of fifty pieces, we had the opportunity to see the latter, and are sharing photos of it with you today. As you can see, it is clearly at its heart a ROO, but it’s also distinctively different, with a new case design. With a significantly thinner bezel, this new 45mm sized watch has a more open dial, and the angularity of the octagon somehow seems almost a bit softer, although everything else about its looks are anything but. The Royal Oak offshore ‘look’ is still here, but it’s a lot more bold, contemporary, and assertive in presence than the usual ROO. The case shape is fundamentally the same, as are the use of the hexagonal screws, the chronograph pushers, and the mix of materials such as ceramic (for the pushers and crown) and sandblasted pink gold (titanium for the steel model) for the pusher guards, contrasting with the rose gold. The metal-matching hands are lumed. On the dial side, the tourbillon at 9 o’clock and opposite, at 3 o’clock, is the 30 minute counter for the chronograph function. You’ll note that the skeletonised bridges extend from the screws, accentuating the octagonal shape and the angularity of the design. The movement is suspended inside the case, held in place by the screws via skeletonised bridges. Of particular difference is that the screws are are, unusually, under the sapphire crystal. So the movement that is powering this tourbillon and column wheel chronograph. It’s the new in-house manual wind Calibre 2947, with seven days of power reserve, which derives from the Calibre 2912. The 353 part movement has 173 hours of power reserve. The watch itself is very modern, but the finishing is a combination of old and new, with sandblasting (bridges), black polishing (tourbillon cage), and straight graining on the chronograph’s levers. It comes on a rubber strap that is integrated to the case, with the pin buckle in pink gold for this model, and stainless steel for the other model. The crown, as usual, contrasting from the rest of the case, is no more rubber coated but crafted in black ceramic. Royal Oak Offshores aren’t intended to be discreet watches, and this model celebrating its first twenty five years is no shrinking violet. It has the signature ROO design codes, but arguably stretches them into the Royal Oak Concept watch territory, aesthetically. Which makes for a more striking watch that signals a look to the future of the watch’s design. Limited to only 50 pieces each, the Royal Oak Offshore Tourbillon Chronograph 25th Anniversary in pink gold has an RRP of 310,000 CHF and the stainless steel model is 275,000 CHF.